The currency of Hungary is called the forint. Its ISO 4217 code is HUF and its symbol is ft. It is subdivided into 100 fillers, which came from the German word Heller, but fillers are no longer circulated. It was introduced in August 1946 and it remained stable until the 1980s. The name came from Florence. Florentinus, a gold based currency, which was later called the forint, was used in 1325. In Hungary, the name forint was used from 1868 to 1892. It was reintroduced in 1946. Since then, the forint remained stable until during 1970s and 1980s. The forint inflated yearly after the shift in democracy for three years. The forint had a high value since the year 2000. 1, 2, and 5 forint coins and 2, 10, and 20 filler coins were introduced in 1946. In 1948, 5 and 50 fillers were introduced while 10 forint coins were introduced in 1971, and 20 forint coins in 1982. 50, 100, and 200 forint were introduced in 1992, together with a new series of coins. In the same year, 2 and 5 fillers ceased production. In 1999, the government withdrew all filler coins from circulation. 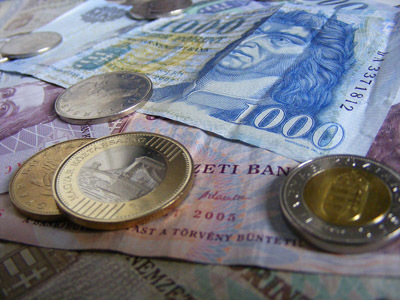 1 and 2 forint continued to circulate until the first quarter of 2008. A 200 forint coin was made in replacement for 200 forint notes on mid of 2009. Bank notes with denominations of 10 and 100 forint notes were introduced by the Hungarian national bank in 1946. 10, 20, and 100 forint notes of higher quality were introduced in 1947 and 1948. 50 forint were introduced in 1953, 500 forint notes in 1970, A new series in denominations of 200, 500, 1000, 2000, 5000, 10000, and 20000 forint notes were introduced between 1997 and 2001. In 1990, the exchange rate between the US dollar and Hungary forint is 1 USD = 62.54 HUF. The value continued to increase in the following years until it reached the rate of 1 USD = 279.62 HUF in 2001. From there, the value of HUF against the US dollar fluctuated. The current exchange rate is 1 USD = 198.73 HUF. Hi, great website. Found it very interesting. I’m studying Hungary and travelling there soon. I can’t wait! I hope this website comes in handy to someone else too! Hi,can anyone tell me what a 2 forint from 1982 is worth?I just found one while sorting through some change.I know it is from Hungary. Is it worth anything?Now that I have found it I want to know what it is worth.I’m curious! America but I’m not completely positive.